This is the second part in the Angular 2 series. You can read part one here. We covered the basic idea of components and decorators in an earlier article, and have specifically seen the @Component and @View decorators used to build an Angular application. This article dives in a bit deeper. However, we can’t cover everything about components in a single article, so future articles will take up other aspects of Angular 2 components. The above describes an individual component, but Angular 2 applications are actually made up of a hierarchy of components – they begin with a root component that contains as descendants all the components used in the application. Angular 2 components are intended to be self-contained, because we want to encapsulate our component functions and we don’t want other code to arbitrarily reach into our components to read or change properties. Also, we don’t want our component to affect another component written by someone else. An obvious example is CSS: if we set CSS for one component, we don’t want our CSS to “bleed out” to another components just as we don’t want other CSS to “bleed in” to our component. With that high-level look at Angular 2 components under our belt, let’s look at two properties that can be passed to the @Component decorator to implement the downward and upward flow of data: “inputs” and “outputs.” These have sometimes been confusing because, in earlier version of the Angular 2 alpha, they were called “properties” (for “inputs”) and “events” (for “outputs”) and some developers were less than enthralled with the name change, though it does seem to make sense: https://github.com/angular/angular/pull/4435. “Inputs”, as you might guess from the hierarchy discussion above, specifies which properties you can set on a component, whereas “outputs” identifies the events a component can fire to send information up the hierarchy to its parent. The “inputs” property passed to the @Components decorator lists “myname” as a component property that can receive data. We also declare “myname” as a public property within ParentComp class. If you don’t declare it, the TypeScript compiler might issue a warning. The “outputs” property lists “myevent” as a custom event that ParentComp can emit which its parent will be able to receive. Within the ParentComp class, “myevent” is declared as and set to be an EventEmitter. 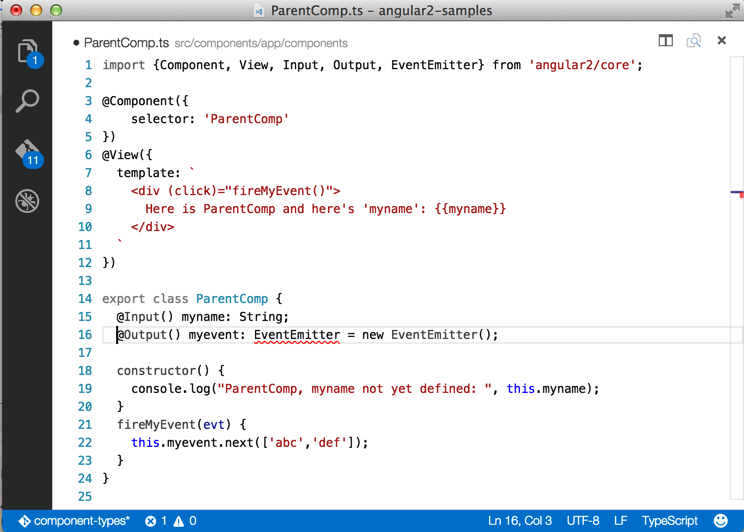 EventEmitter is a built-in class that ships with Angular that gives us methods for managing and firing custom events. Notice that we had to add EventEmitter to the import statement at the top of the file. This component displays the incoming “myname” in the view, but when we try to access it in ParentComp constructor it’s not yet defined. That’s because input properties aren’t available until the view has rendered, which happens after the constructor function runs. We added a “click” event handler to our template that invokes the myeventEventEmitter’s “next()” method and passes it the data we want to send with the event. 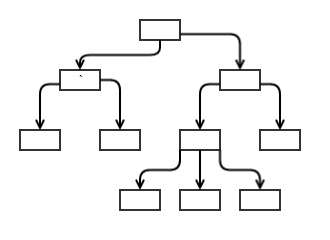 This is the standard pattern for sending data up the component hierarchy — using “EventEmitter” to call the “next()” method. 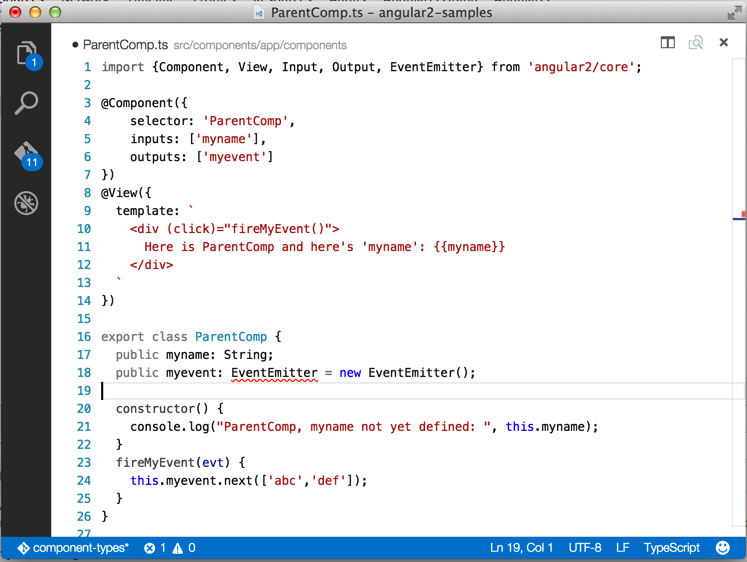 (myevent) = "handleMyEvent($event)": This tells Angular to invoke the CompDemo “handleMyEvent($event)” method when ParentComp fires “myevent.” The data that we passed to the “next()” method in ParentComp is available in CompDemo by passing “$event” as an argument to the “handleMyEvent()” method. In both cases, the left side of the attribute refers to something in ParentComp (an input property or an output event) and the right side refers to something that’s interpreted in the context of CompDemo (an instance property or a method). 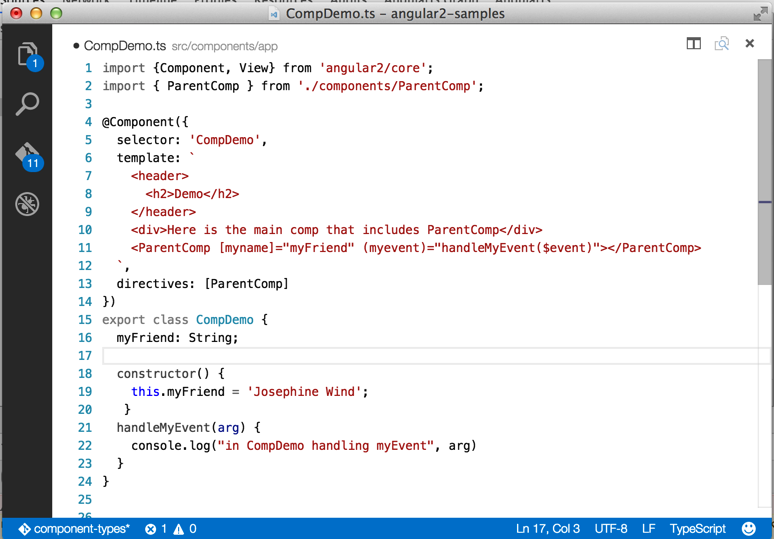 If you try to set a property on ParentComp without specifying it as an input property, Angular won’t throw an error, but it also won’t set the property. The above pattern — passing data in through an “input” property and sending data out through an “output” event — is the primary way to share data between Angular 2 components. We’ll see in a future article that we can also share data between components by defining services that can be injected into components, effectively giving us a way to share data or functions between components. 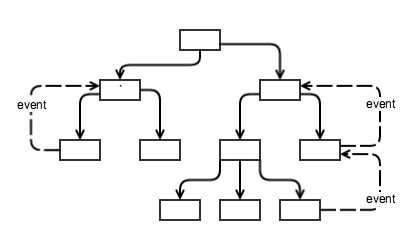 Whether you use inputs/outputs or @Input/@Output, the result is the same, so choosing which one to use is largely a stylistic decision. In this article, we’ve looked in more depth at Angular 2 components, how they relate, and how you pass data into them and how to get data back out. We’re still only scratching the surface in terms of components; they’re arguably the major feature of Angular 2 and are involved in every aspect of designing and building Angular 2 applications. In future articles, we’ll continue to explore Angular 2 components by looking in more detail at Angular services as a way to re-use code and encapsulate key functionality. David is a consultant with DevelopIntelligence and Senior Developer at Salesforceâ€™s Desk.com working with Angular technologies on Deskâ€™s NextGen support application. He is currently working on a team that is developing an entirely new set of features for Desk built on Angular components with initial release planned for 2016. He spends his free time doing what his wife tells him he will enjoy doing which often includes spending time with the family (which he does in fact enjoy). He is also one of the authors of Angular 2 in Action.